New article by Andrew Chadwick: "The Changing News Media Environment"
James Stanyer and I have just had a new article published. 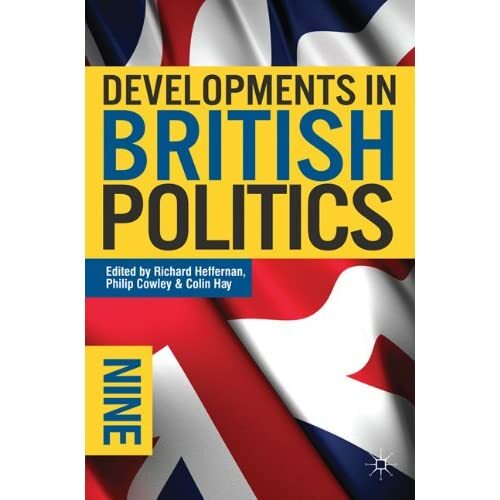 It's in the latest volume of the bestselling book about British politics, Developments in British Politics 9, edited by Richard Heffernan, Philip Cowley, and Colin Hay, and published by Palgrave Macmillan. The chapter covers new media usage patterns, the changing face of news consumption, the growing pressure on newspapers, Gordon Brown's relationship with the press, the changing nature of media management inside Number 10, and the experience of Britain's first live televised prime ministerial debates during the election of 2010. To give you a flavour of what's in it, here's an excerpt, from the conclusion. As this chapter has shown, the political communication environment in Britain is in transition. While broadcasting still remains at the heart of national political life, the nature of mediated politics is evolving rapidly and in directions that are sometimes contradictory, sometimes complementary. The election leaders’ debates reinforced television’s predominance, though as we saw above, even those events were accompanied by a panoply of online activism, some of it facilitated by the broadcasters themselves. The way citizens consume political information is changing in the new digital environment. As use of the internet and mobile technologies has grown, so they have become an important port of call for those seeking political news. Audiences have never had access to so much political information through such a variety of news outlets. At the same time, these technologies provide new opportunities for audiences to engage in political activities, express their opinions and contribute content in historically unprecedented ways. The evidence suggests that growth in the numbers taking advantage of these interactive opportunities is likely to continue. There are, however, cautionary themes. Concerns about the stratified nature of the digitised public sphere remain. Those that take advantage of new technologies to participate in politics remain a minority and still tend to be wealthy, well educated and younger. Second, this new communicative digital space has also impacted upon politicians and media organisations, creating opportunities, but at the same time new uncertainties. Established news outlets remain a visible presence but face financial pressures. While news organisations have responded innovatively, competition, shrinking audiences, and lower revenues – especially from advertising – have negatively affected their resource bases. There have often been no alternatives to cost cutting. The public service provider, the BBC, has fared well up to now, but it too is likely to face future financial constraints, and this may well have implications for the quality of news citizens receive. Politicians and their strategists have been forced to adapt to a rapidly pluralising digital sphere. Party leaders have promoted themselves using a range of interactive features to try and connect with citizens, albeit with varying degrees of success. While the internet has opened up new ways for politicians to interact with the public, it has also posed a series of challenges. Some aspects of the online information environment have proved difficult to control. The fast-moving news cycles require constant monitoring and are significantly more difficult to direct. The public spread of gossip and rumour is perhaps more common place. While political elites have been keen to be seen embracing new media, they are understandably less keen to be seen reverting to necessary but dubious methods of control. The leaked emails that led to “Smeargate” reveal, not only that some old command and control techniques of the broadcast era are still hugely important, but also that the new media environment is inherently porous. Understanding the complex new political communication environment in the twenty-first century remains a challenge, but one to which students of politics must rise if they are to fully comprehend the nature of British democracy. The book as a whole is excellent and as usual it's a must-read for anyone interested in British politics. You can buy a copy now from Amazon here. It will publish in the U.S. in August and will be available here. The full reference for our piece is: Chadwick, A. and Stanyer, J. (2011) "The Changing News Media Environment" in Heffernan, R., Cowley, P. and Hay, C. (eds) Developments in British Politics 9 (Palgrave-Macmillan), pp. 215-237.